Flexible Box (“Flexbox”) Layout, which will allow child element positioning, use unused space within the box and handle resizing and different browser resolutions. Grid Alignment, which will allow to divide a container into rows and columns for better positioning and better handling of screen resolution changes. MS’ people are the ones currently signed on this draft. Multi-column Layout Module, which allows content to be split into columns with a “gap and a rule between them”. Gradients, which allows gradient coloring of the background of graphical elements. From a preliminary reading of these features and abstracts, it looks like the first three items are targeting not only the web developer’s usual difficulties of supporting different resolutions and browser resizing, but also the dynamic layout of the tablet world which storms upon us all. With regards to IE10, being used to a slow delivery pace of IE browsers over the years, especially the 5 year gap in between IE6 and the release of IE7, Microsoft finally seem to realize that they have to take the browser development to a rapid pace, and especially compete with Google Chrome’s ultra quick release of their browser updates. Unfortunately my current favorite browser, Firefox, seems to lag behind, at least as far as the version numbering and the buzz involved, but not necessarily in quality. I guess that as long as Firefox maintains the leadership in extensions, or so it seems, it will still find a place amongst IE and Chrome. I’m uncertain however regarding IE’s extensions. I guess that MS has to encourage a developer community to develop more and more extensions in order to compete with Chrome and FF. All in all, I’m content that Microsoft seems to be taking on this seriously, providing faster and more standard compliant browsers. We, users and developers alike, are only expected to gain from this competition, as long as the different browser manufacturers maintain W3C standards, unlike Microsoft’s earlier browsers. If you would like this sample code, right click here and “save as” to download. Then rename to a zip file and open. In my previous post I have discussed and demonstrated how you can easily use jQuery and a ASP.NET MVC’s Partial View to accomplish an UpdatePanel-like solution. In this post I’d like to demonstrate a “real world” usage of this technique. I could render the login dialog as a hidden dialog (“display:none”) in the Partial View (or layout). This is possible, will save a round trip to the server when the user requests to login, but is also quite “ugly” as it is inefficient to render a hidden dialog every time. I could have an UpdatePanel like implementation. Using a placeholder div, I could request another PartialView from the server on demand. The html rendered will be then “injected” into the placeholder div. I figure that this is way more efficient than the first option and can be considered, well, “nice”. 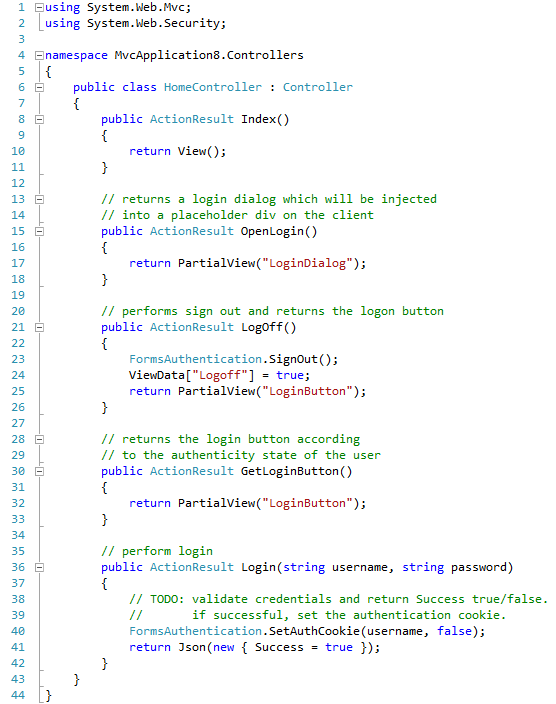 We’ll create (or rather re-use MVC’s template code) a Partial View to represent a Log On/Log Off button. This will be rendered from the layout onto all pages. This view will also contain a place holder div, which will be injected with the log-in dialog. We’ll create a Partial View for the login dialog. This is basically a simple div which wraps the username/password textboxes. This will not be rendered anywhere at design time. We’ll use jQuery’s ‘load’ method to perform an Ajax call to the server, and return the Partial View of the log-in dialog. The dialog’s html will be injected into the place holder described in stage 1. We’ll create server side code to support the logon/logoff scenarios. “Strategy”: The login button’s partial view is going to have a wrapping div, which will change according to the whether a user is logged in or not. This will be rendered at first according to the authenticity state, but will change at run-time according to the user’s operations. This will be described in 4 stages below. Stage 1: Login button (Partial View). I reused MVC’s template code to do this. The entire code is wrapped with a div (‘divLoginButton’), whose contents will dynamically change according to Log on/log off operations performed by the user. Line 1 is the wrapping div. Line 2 is the server side code which decides whether a Log On or Log Off button will be rendered from the server. Lines 4-9 represents a Log Off button. The user is logged in, authenticated, and has not requested to logoff (line 2 makes that decision). Line 7 contains an Ajax call to actually perform the log off, and to replace the div’s entire content with a new state. This really resembles a Web Form’s UpdatePanel’s behavior, only cleaner and more efficient. Lines 13-28 represent a situation that the user is not authenticated and a Log On button is displayed. In line 17 we query whether the login dialog has already rendered from the server. This can happen if the user has clicked the Log On button, the dialog has rendered from the server (line 19), but has not logged in (e.g. clicked the Cancel button of the dialog). In this case, there’s no point in reloading the dialog from the server, so we reset the username/password fields (line 22) and reopen the dialog (line 25). Lines 29-30 is the place holder for the login dialog. Lines 1-13 represent the “dialog”. This is just a basic div with username/password textboxes. This will be displayed as a modal dialog using jQuery UI’s Dialog. Because the dialog is set to autoopen, this will be automatically opened when rendered for the first time. Line 23 indicates a POST ajax call. 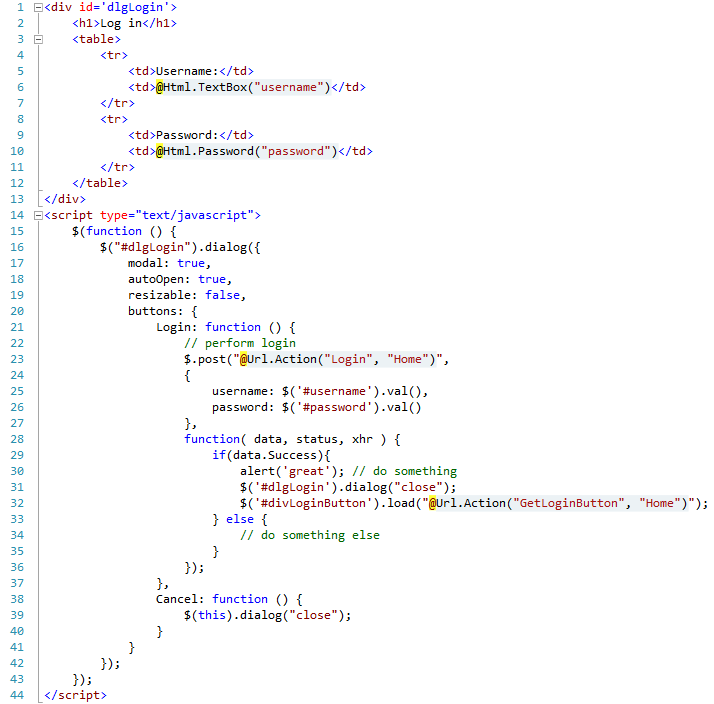 POST is done for security as I’d rather have the username/password (lines 25/26) not sent in the query string. The Ajax call is for the Login action method in the Home Controller. Line 32 is executed when the result of the Login method is “Success”. This is what does the trick of replacing the “Log On” button with a “Log Off”, similar to the signout process discussed in Stage 1 above. It is possible to return the PartialView directly from the Login action (line 23), but I wanted to render a Success boolean in order to have more control, especially in case the Login fails. Stage 3: Server side code to support the Log On / Log Off situations. Lines 15-18 return the Login Dialog partial view. Lines 21-26 supports a Log Off scenario. Line 23 performs the actual Sign Out. Line 24 instructs the LoginButton partial view that although the user is still authenticated at this point, a Log On button should be rendered and not a Log Off button. Lines 30-33 return a Log On or Log Off button, depending on the authenticity state of the user. Basically this is used after a successful login operation, when we would like to render a Log Off button. Lines 36-42 represents a Login process. Line 38 should be replaced with actual Membership user login validation check. If true, line 40 sets the authentication cookie. Line 41 returns if a successful login was performed. As you can see, in this example the login is always a success. Stage 4: Render the Login button in the layout (“Master Page”), so it’s visible throughout all the pages. Line 11 represents the Login Button partial view (Log On / Log Off button). Lines 5 and 8 are jQuery UI (required for the modal dialog). Here’s how it looks. At first, the page is loaded and the Login button is rendered as a Log On button. Finally, when we click the Log Off button, another “refresh” takes place as the server’s LogOff button returns an updated Login Button. In this post I will briefly discuss how to use a PartialView either as a Web Form’s “UserControl” or as an “UpdatePanel”. You can click on the links to navigate accordingly, or just read on. 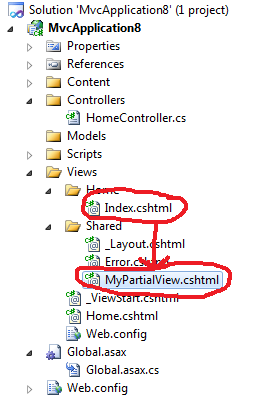 UPDATE: If you’d rather have a “real world” example, you can read this post: https://evolpin.wordpress.com/2011/04/26/asp-net-mvc-partial-view-and-ajax-real-world-example/. I’ve wanted to use a PartialView for quite some time now. 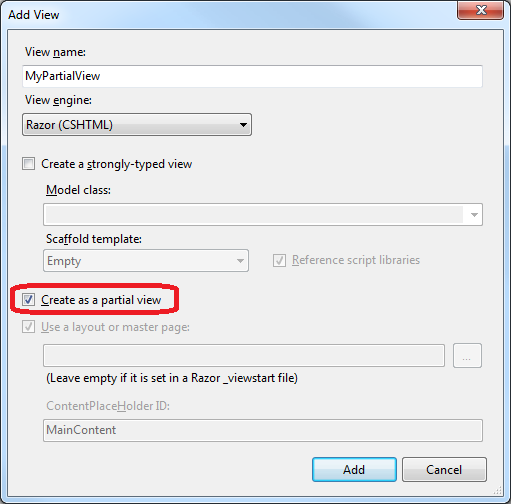 A PartialView provides two functionalities which aren’t necessarily overlapping although have much in common. In comparison with Web Forms, a PartialView is a kind of a UserControl, but it also provides a kind of UpdatePanel. One more thing worth mentioning, is that the ViewData dictionary which can be populated in the Controller, is available both to the View and to it’s Partial Views. As I mentioned earlier, Partial Views can also provide a functionality resembling Web Form’s UpdatePanel. Those familiar with UpdatePanel usually either appreciate the (relatively) ease of use, or despise it for being so heavy and inefficient. Almost an Ajax “wannabe”. Personally, I think that UpdatePanel has its place in Ajax side by side with PageMethods/WebMethods. I consider it the better alternative for rendering a “mass” of html onto the client, especially when paging or sorting grids. In MVC, a PartialView could perform this exact functionality, and could prove to be the better solution for rendering plenty of html to the client. Create a place holder html control. 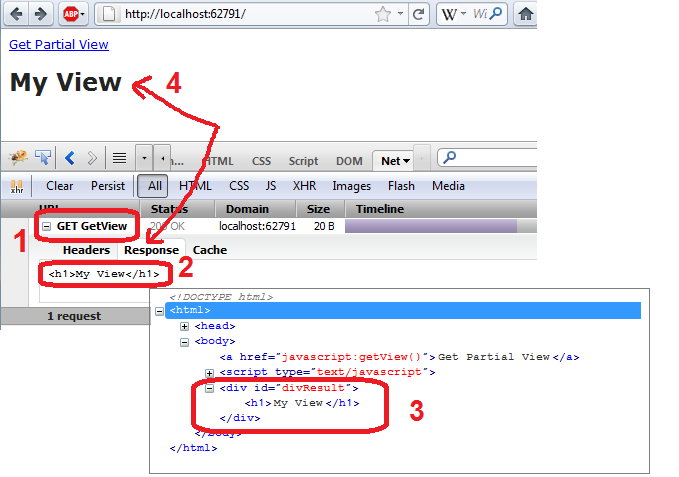 Use jQuery’s load method to fetch the partial view from the server and inject it into the place holder. Create a server side Action in a Controller that will return the partial view. Line 4 is the simple one-line code which performs an ajax call to the server’s GetView action in the Home Controller (will be done shortly), and injects the result. Line 7-8 is where the result will be injected to. The load method performs a GET operation to the server’s GetView. Response is returned with html. jQuery injects the result in the place holder div. The result is rendered in the browser. As usual, credits are in order. This great post summarizes different jQuery Ajax approaches with ASP.NET MVC. BTW: If you ask yourself why you should use jQuery instead of Microsoft Client libraries, I guess you should relate to Microsoft’s statements about “throwing its weight behind jQuery”. You can read about this in Stephen Walther’s blog. Stephen’s conclusion says it all: “Our plan is to focus on jQuery as the primary technology for building client-side Ajax applications moving forward. We want to adapt Microsoft technologies to work great with jQuery and we want to contribute features to jQuery that will make the web better for everyone. We are very excited to be working with the jQuery core team.” Although MVC 3 comes with Microsoft Ajax client scripts, it also includes jQuery and I guess that we’ll see more and more of jQuery in Microsoft’s VS templates.